U.S. Government anti-terrorism, force protection, and military planners and assessors have identified drone carried improvised explosive devices (DCIED) as an emerging threat to US and Allied critical infrastructure (read more here). To better assess the potential risk from DCIED threats, improved response models for structural, system, and human vulnerabilities subject need to be developed. The Department of Defense’s current force/mission protection planning tools contain assessment models for buildings and equipment subjected to explosive threats at stand-off distances more typical of vehicle-borne threats – usually many meters away. However, the mobility afforded by a drone delivery platform means that an understanding of the response of components subject to explosive devices placed in contact or very near-contact is now critically important. Moreover, the subsequent hazards created from the debris of these targeted components must also be considered. Until very recently much of the research, development, and protective design effort for smaller improvised explosive devices has focused on briefcase bombs and suicide bombers, where traditional security measures should be able to limit the threat to near ground level (e.g., the ground floor of buildings, or near street level for external targets). 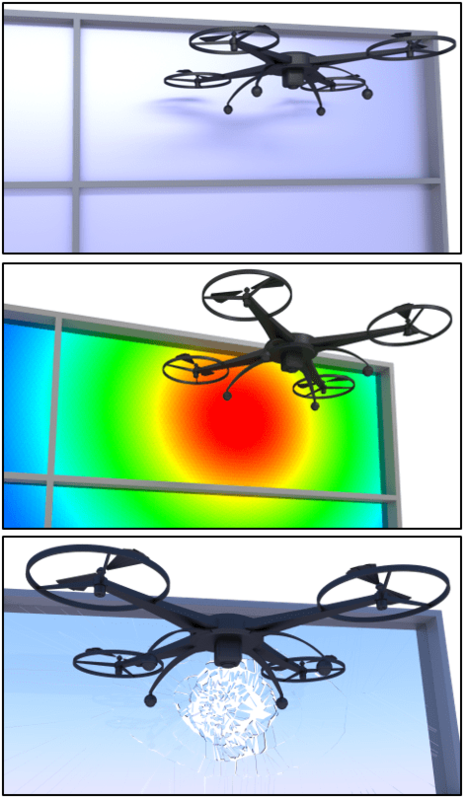 However, the drone threat introduces a 360-degree threat environment that can potentially bring contact charges to upper floors, against windows, exterior walls, roofs and utilities. To be able to plan and design mitigation from these threats, the hazards associated with potential attacks must be better understood. PEC addresses these novel threats with a number of complimentary skill sets including an understanding of weapon effects phenomenology, modeling and simulation, threat characterization and assessment, blast resistant design, and potentially most critically – weapons/explosive testing. For more information on PEC’s efforts to mitigate and defeat the effects of drone threats and DCIED, contact Aldo McKay and Kirk Marchand.